Ambrose is the twin brother of Sarah Josephine Kerney. Private Ambrose Albert Kerney embarked the troop ship "Duntroon" for Port Morsby, New Guinea. Disembarked troop ship "Duntroon" at Port Moresby, New Guinea. Joined 25th Battalion which served at Miln Bay and Donadabu (near Port Morseby) until the battalion returned to Cairns 24 Dec 1943. NX163719, Private Ambrose Albert Kerney enlisted in the Australian Army on 13 May 1943 and served until his discharge on 20th June 1946. Private Ambrose Albert Kerney enlisted in the Australian Army 20 Feb 1930 and served until discharge 20 Jun 1946. Nx163719 (N410835) Private Ambrose Albert Kerney, World War 2 Nominal Role. NX16379 (N410835) Private Ambrose Albert Kerney enlisted in the Australian Army 13 May 1943 at Kandos, New South Wales and was discharged 20 Jun 1946. Private Ambrose Albert Kerney NX163719 world War Two Military Service Certificate. Ambrose Albert Kerney is the son of John Joseph Kerney (Jack) and Ina Ethel Florence Kerney. He enlisted in the Australian Armey 13 may 1943 and discharged 20 June 1946. 9 Fleming Street, Kandos, New South Wales, Australia. 22nd December 1943 embarked on the Troop Ship "Canberra", at Port Morseby,New Guinea, Disembarking at Cairns, Queensland, Australia the same Day (22 December 1943). For his service during world war 2, Ambrose Albert Kerney was awarded the 1939/45 Star, Pacific Star, War Medal and the Australian Service Medal. • Navy - awarded for six months service afloat in areas of active operations from 3 September 1939 to 2 September 1945. • Army - awarded for six months service in an operational command during the period 3 September 1939 to 2 September 1945. • Air Force - awarded to all aircrew who have taken part in operations against the enemy, subject to at least two months in an operational unit and to all non-air crew who served six months in the area of an Army operational command. A gold rosette worn on the ribbon signifies participation in the Battle of Britain, 1 July 1940 to 31 October 1940. • Merchant Marine - awarded under the same conditions as Navy provided that at least one voyage was made through a specified area of active operations. Awarded for 30 days full-time or 90 days part-time service at home or overseas in the Australian Armed Forces and the Australian Mercantile marine between 3 September 1939 and 2 September 1945. 6 George Street, Queanbeyan, New South Wales, Australia. Ambrose Albert Kelly died 4 February 1960 at Long Gully, age 39 yrs and he is buried in Roman Catholic Section of the Riverside Cemetery, Queanbeyan, New South Wales, Australia. Ambrose Albert Kerney's grave is located in the catholic Section of the Queanbeyan riverside Cemetery. 1943 Commonwealth Electoral Roll for the State of New South Wales, Sub Division of Orange - Ambrose Albert Kerney. Electoral Roll No. 5555, Ambrose Albert Kerney. [S58] John W Bernie (Reliability: 3). [S120] John Bernie (Reliability: 2), 18 Jan 1920. [S437] Australian World War Two Military Service Record, Australian Government, (National Library of Australia), 2 (Reliability: 3), 20 Feb 1920. See page two of Ambrose Albert Kerney World War 2 Military Service Record. [S123] World War 2 Nominal Roll, National Archives of Australia, 1 (Reliability: 3), 20 Feb 1920. See attached World War 2 Nominal roll for Private Ambrose Albert Kerney. [S371] Commonwealth Electoral Rolls New South Wales, 93 (Reliability: 3), 1943. 1943 Commonwealth and State Electoral Roll of Subdivision of Orange, New South Wales, Australia. Electoral Role No. 5555 Ambrose Albert Kerney. [S437] Australian World War Two Military Service Record, Australian Government, (National Library of Australia), 6 (Reliability: 3), 23 Mar 1943. [S437] Australian World War Two Military Service Record, Australian Government, (National Library of Australia), 6 (Reliability: 3), 25 Mar 1943. See attached World War 2 Military service Record. [S437] Australian World War Two Military Service Record, Australian Government, (National Library of Australia), 7 (Reliability: 3), 13 May 1943. See attached World War 2 Military Service Record, Ambrose Albert Kerney, page 7. [S437] Australian World War Two Military Service Record, Australian Government, (National Library of Australia), 2 and 9 (Reliability: 3), 13 May 1943. [S437] Australian World War Two Military Service Record, Australian Government, (National Library of Australia), 1 (Reliability: 3), 30 Jun 1946. 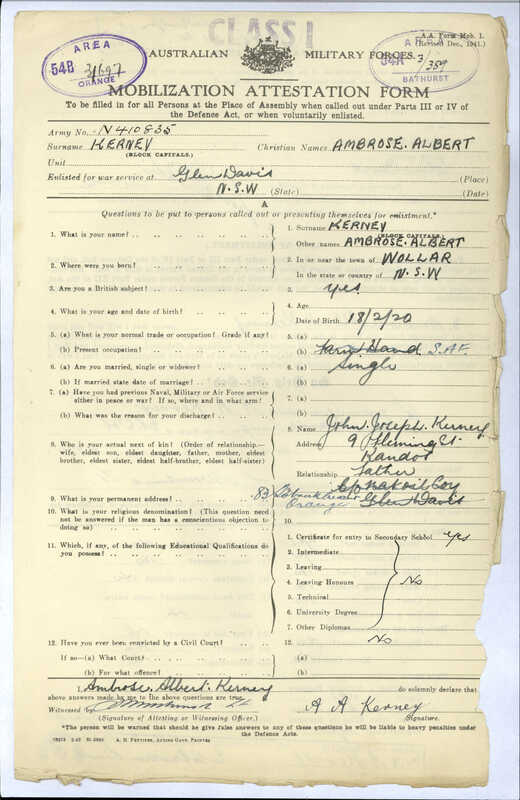 See attached World War 2 Military service record of Ambrose Albert Kerney. [S371] Commonwealth Electoral Rolls New South Wales, 29 (Reliability: 3), 1958. [S120] John Bernie (Reliability: 2), 4 Feb 1957. [S436] Access Canberra, 20003164/1960 (Reliability: 3), 4 Feb 1960. See attached ACT Historic Death Registration Transcription for Ambrose Arnold who died 4th February 1960. [S4] NSW BDM, New South Wales Government (Reliability: 3), 1913.